The year was 2004. I was enrolled in ECE 466 at NCSU, a compiler optimization/scheduling class. I remember walking into the lecture hall and seeing far too many PowerBooks and white iBooks. This was the computer engineering department right? It wasn’t much later that I started my month with a Mac experiment. I spent most of my life at that point staying away from Apple hardware. I wanted to give the platform a fair shake so I bought the fastest thing Apple offered back then: a 2GHz PowerMac G5. More recently, in 2012, I was talking to my friend Lyle who was setting out to build a new gaming PC. Without any coercion on my part, he opted for a mini-ITX build. I’d been on a mini-ITX kick for a while, but motherboard and case vendors kept reiterating as exciting as mini-ITX was, the sales volumes just weren’t there. I was surprised when my gamer friend settled on building a new desktop that was seriously small. He used a BitFenix Prodigy case, a great choice. The last Mac Pro I reviewed was in 2010. Little had changed externally since the PowerMac G5 I bought years ago. I lamented the chassis’ lack of support for 2.5” drives. A year later I abandoned the Mac Pro entirely for a Sandy Bridge MacBook Pro. I was a late adopter for the notebook as a desktop usage model, but a lack of progress on the Mac Pro drove me away from the design. 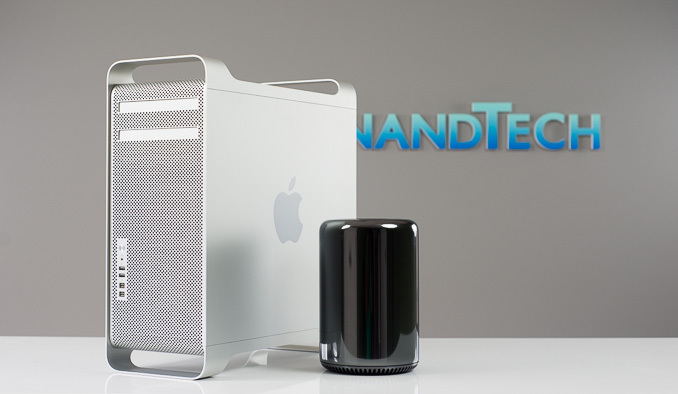 Apple tends to be pretty early to form factor revolution, but given the company’s obsession with mobile it’s understandable that the same didn’t hold true for the Mac Pro. When it finally came time to redesign the system, I’m reminded of the same realization Lyle came to when building his most recent desktop: why does a modern desktop need to be big? The answer is, for a lot of users, that it really doesn’t. Notebooks already outsell desktops by a healthy margin, and there’s no room for expansion inside a notebook. You may be able to swap out a drive or fiddle around with some sticks of DRAM, but no one is adding discrete cards (at least internally) to a notebook. The situation for Mac desktops is even more cut and dry. With the exception of the occasional aftermarket Mac video card and the more adventurous users who are fine with modifying/flashing PC video cards to work on a Mac, I suspect there’s little GPU upgrading going on in the Mac desktop market. That leaves other PCIe devices that get cut out if you go to a design with less internal flexibility. In the spirit of the of the MasterCard commercials: for everything else, there’s Thunderbolt. You can do roughly 1.5GB/s over a single Thunderbolt 2 connector. The protocol passes unmodified PCIe and it’s a technology that Apple has strongly backed since its introduction. Other than a GPU, virtually anything you’d want to connect over PCIe you can do externally via Thunderbolt 2. I think you can adequately make the argument for a smaller form factor Mac Pro desktop, after all, that’s where the market is headed. 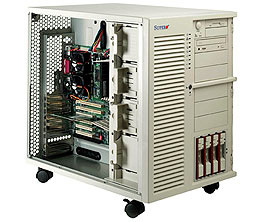 I remember coveting (and eventually owning) Super Micro’s SC830 chassis for my personal machine years ago. I wanted a huge desktop. Regardless of whether I’m talking about a Mac or PC today, I no longer want something massive. The argument for even building a high-end desktop is easy to make. It all boils down to TDP. Regardless of what device you’re building for, assuming you have competent architects, you’re limited by power. The bigger the device, the greater your ability to remove heat and the more performance you can unlock. I’m surprised by how much performance you can cram into a 15-inch MacBook Pro, but there’s still room for more - particularly if you care about CPU and GPU performance. Given how power limited everything else, it’s no surprise that Apple focuses so heavily on the new Mac Pro’s thermal core. 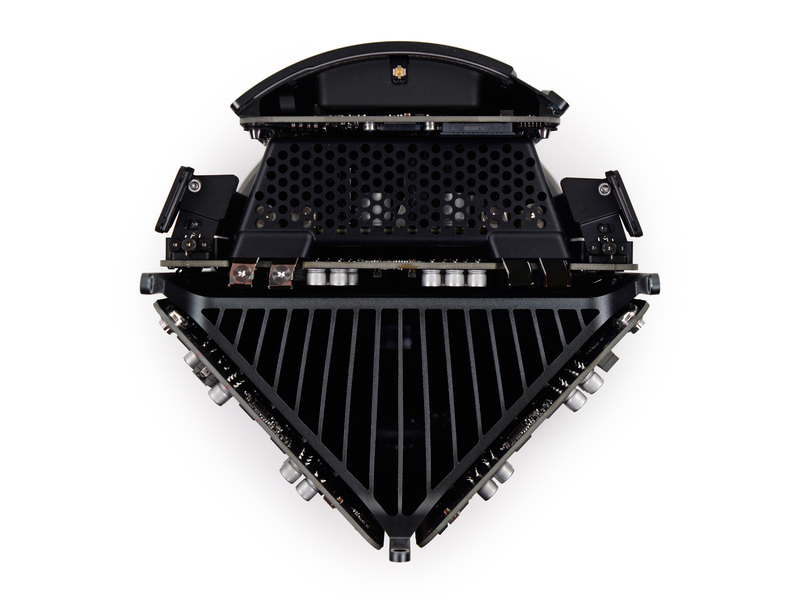 It’s single, unified heatsink that is directly responsible for cooling the three major processors in the new Mac Pro: CPU and two GPUs. The thermal core is in the shape of a triangular prism, with each lateral surface attaching directly to one of the three processors. The shared heatsink makes a lot of sense once you consider how Apple handles dividing compute/display workloads among all three processors (more on this later). A single fan at the top of the Mac Pro’s cylindrical chassis pulls in cool air from the bottom of the machine and exhausts it, quietly, out the top. 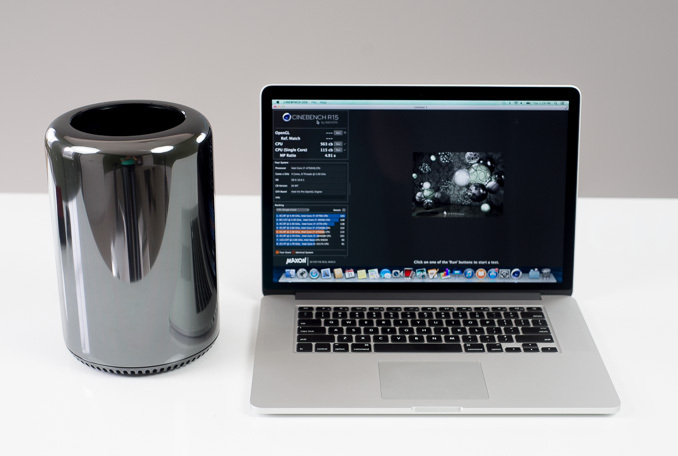 Ultimately it’s the thermal core that the new Mac Pro is designed around. It’s the most area efficient dual-GPU setup I’ve ever seen. There’s little functional benefit to having a desktop chassis that small, but you could say the same about Apple’s recent iMac redesign that focused on making a thinner all-in-one. If the desktop market is to not just stick around but grow as well, it needs to evolve - and that also includes design. The new Mac Pro is a dramatic departure from its predecessors. The chassis is still all aluminum (with the exception of a plastic cover over the fan) but it features a dark anodized finish vs. the bright silver finish of its predecessors. It’s a glossy finish but the good news is that unlike a mobile device it’s pretty easy to ensure that the system remains looking clean. 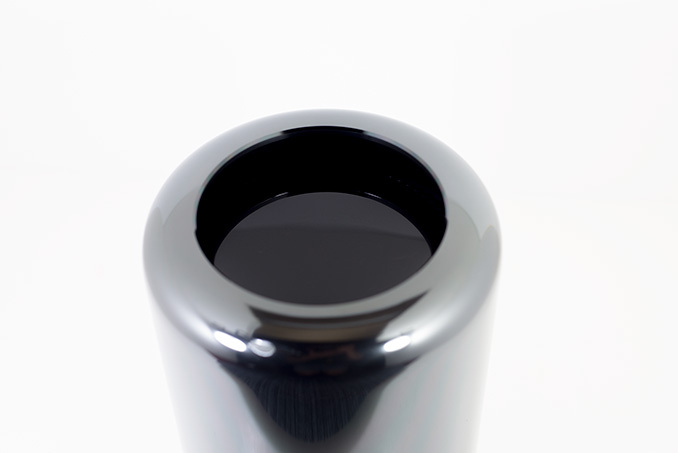 The surface of the new Mac Pro is also incredibly smooth. There's a heft and quality to the design that is at odds with how small and portable it is. I'm hardly an art critic but I do feel like there's a lot to appreciate about the design and construction of the new Mac Pro. I needed to move the system closer to my power testing rig so it ended up immediately to the left of me. I have to admit that I've been petting it regularly ever since. It's really awesomely smooth. It's actually the first desktop in a very long time that I want very close to me. It feels more like a desk accessory than a computer, which is funny to say given just how much power is contained within this tiny package. 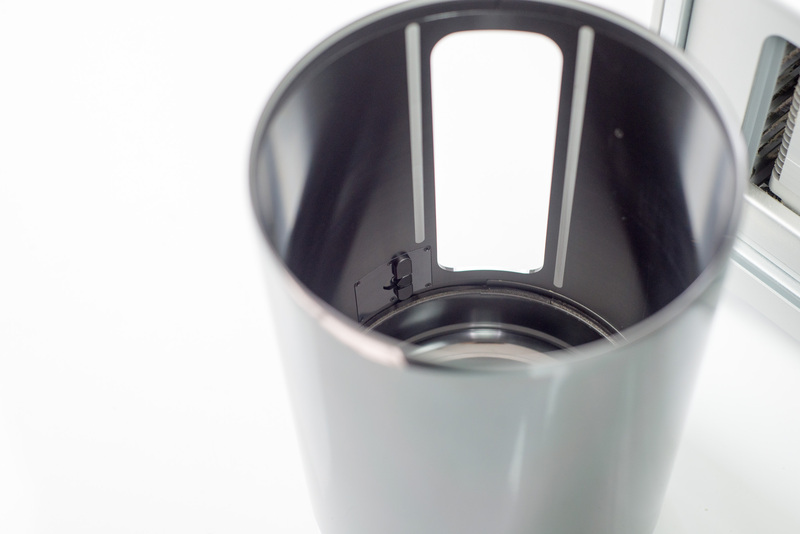 Thanks to its small size (9.9” tall with a 6.6” diameter), the Mac Pro belongs on your desk - not underneath it. The design doesn’t attempt to hide IO, but rather draws careful attention to it. All IO ports are located on the same side of the machine. There’s an integrated sensor that can detect tilt/rotation and illuminates the IO panel on the Mac Pro to help you plug in cables. Admittedly port density is so high back there that I don’t know if illuminating it helps all that much, but it’s a nice effect nonetheless. Otherwise there’s only the power button LED that indicates the system is on. Internal expansion is more or less out of the question. 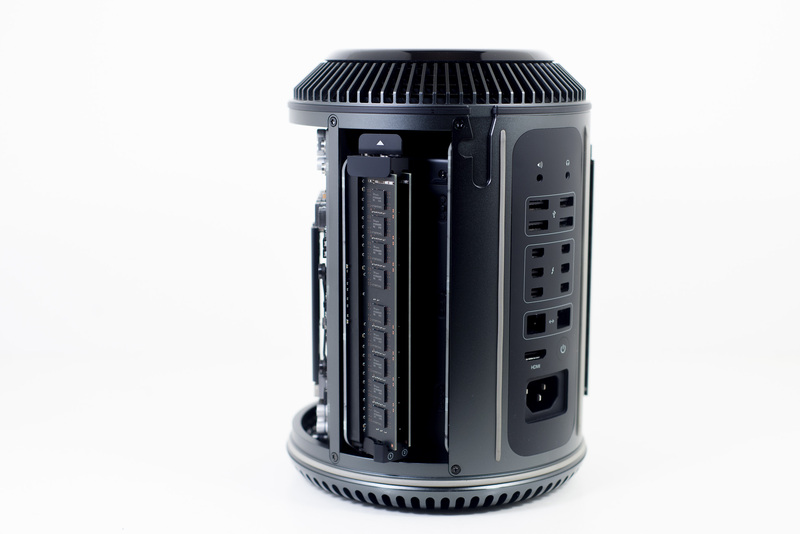 The Mac Pro remains the easiest Mac to get into. There’s no special screwdriver needed, just a simple latch on the back that unlocks the external housing. 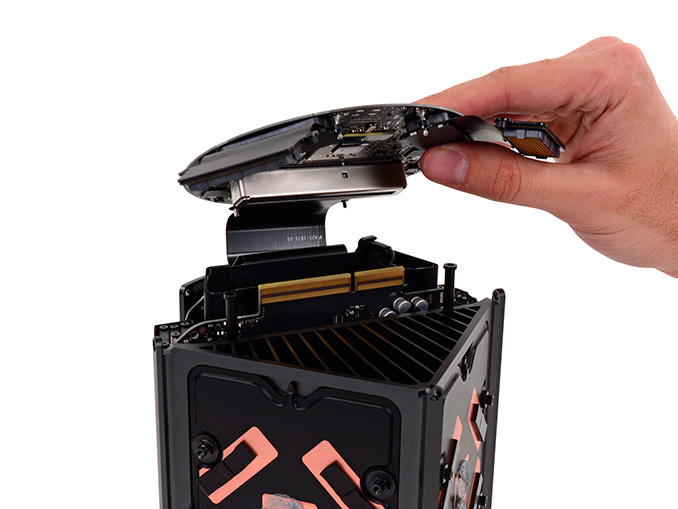 Lift it up and you’re presented with the backs of the CPU and GPU cards. Behind one of the GPUs is the removable PCIe SSD, and flanking the IO panel are four user accessible DDR3 DIMM slots. Push down on the lever marked with an arrow and you’ll release the angled DIMM slots, giving you access to remove/upgrade memory. The Mac Pro supports up to 64GB of memory, which you’ll want to install in groups of four in order to populate all memory channels stemming from the Ivy Bridge-EP CPU. Both GPU boards are custom, so it would appear that Apple has effectively killed the limited 3rd party Mac GPU upgrade market. 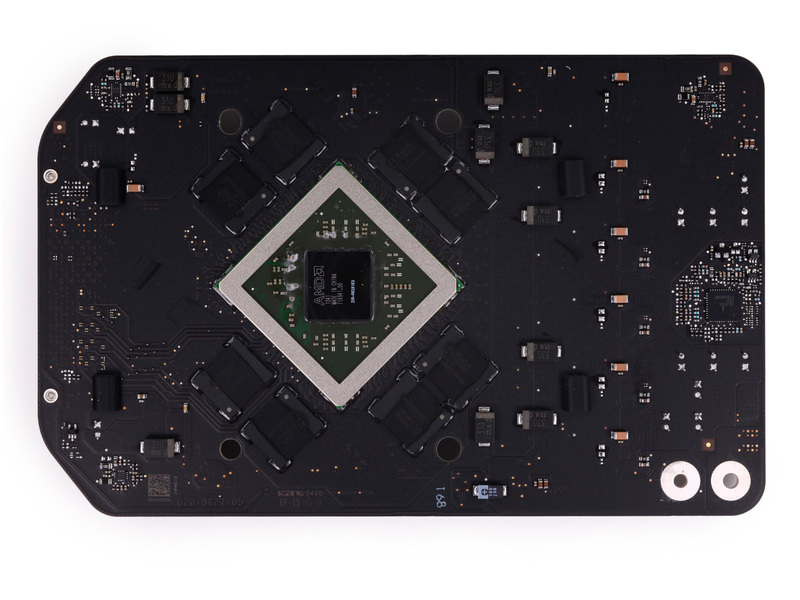 It’s entirely possible that someone will clone Apple’s GPU card design here, but that seems like a lot of effort for very limited potential sales. The CPU board is the only one fully obscured from view; it’s behind the IO panel. There’s only a single LGA-2011 CPU socket on that board, capable of supporting Intel’s latest Ivy Bridge-EP Xeon CPUs. Interestingly enough, Apple appears to be using unmodified Xeon processors with their integrated heat spreader attached. Long time readers of our Mac Pro reviews will remember that the Nehalem Mac Pro actually featured Xeons sans IHS, which made aftermarket upgrades a little trickier (and potentially dangerous). What this means is that you should, in theory, be able to upgrade the Mac Pro’s CPU down the road should you want to. It’s definitely not a simple task but at least feasible. Especially as Xeon pricing drops down the road, this may be a good way of extending the lifespan of your Mac Pro. All three boards connect to the main logic board (MLB) at the bottom of the mini tower. It’s on the MLB that you’ll find Intel’s C602 PCH (Platform Controller Hub) along with high density connectors (CPU board) and flex cables (GPUs) for all of the daughter boards. The new Mac Pro still has an internal speaker. There's not much to say about it, it's ok in a pinch if you need audio and don't want to hook up external speakers. I've had one weird issue with the internal speaker: it occasionally produces a high pitched noise, requiring a power cycle to clear. I haven't been able to root cause the problem yet, it seems to happen while the speaker is muted (only to surface once I've unmuted the speaker) and after I've been torturing/benchmarking the machine. I'm not sure if it's tied to plugging/unplugging Thunderbolt 2 devices while it's on or if it's something in software that's triggering it. Either way if you see it on your system, know that you can clear it by a full power cycle (not soft reset). 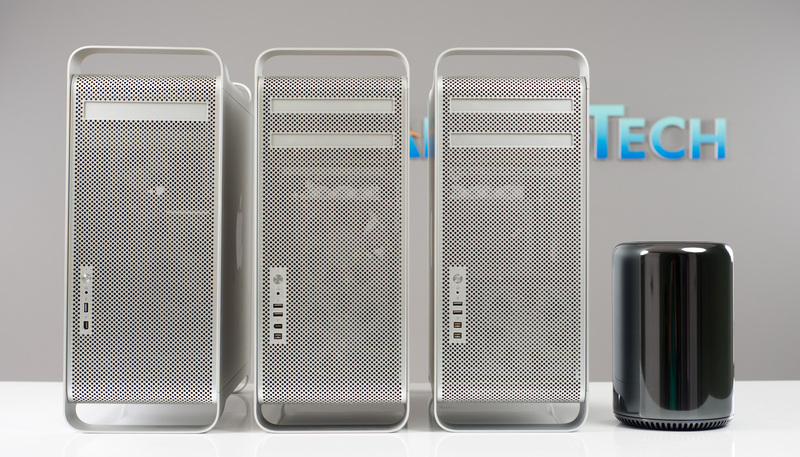 Apple offers two Mac Pro configurations with several upgrade options from the factory. The entry level machine remains a quad-core configuration with 12GB of RAM, while the high end model moves to a 6-core design with 16GB of RAM. Both ship with two GPUs by default, but you can upgrade the pair’s potency. The Mac Pro’s pricing is point of contention given that the cheapest configuration starts at $2999 and can go all the way up to $9848 before adding in a display. Given the lower volumes we’re talking about here and the fact that Apple continues to only spec workstation hardware for the Mac Pro on the CPU (and somewhat on the GPU side, more on that later) I’m not sure we’ll see the same aggressive price drops that we’ve seen in other Mac segments. (D x W x H) 6.6 x 6.6 x 9.9" 17.5 x 7.0 x 17.63" 19.0 x 6.89 x 18.8"
As I learned last time, there are typically some hefty discounts associated with workstation orders so take this pricing with a grain of salt. I also had to fudge the HP numbers a bit as I can only get a single FirePro W7000 in the Z420 configuration - I just doubled the W7000 adder in order to simulate what a theoretical dual GPU version would cost. There are other imbalances between the comparison (HP supports more displays, Apple features more Thunderbolt 2 ports, FirePro W7000 features ECC GDDR5, etc…), but the point here is to see if Apple’s pricing is out of touch with reality. It’s not. The DIY PC route is still going to be more affordable. If we go the Ivy Bridge E route and opt for a Core i7-4930K, you get more cores than either of the options above for around $600 for the CPU. Adding in another $330 for a motherboard, $180 for 12GB of DDR3-1866 memory, $1400 for two W7000 GPUs and $220 for a fast SATA SSD (Samsung 840 Pro) we’re at $2730 for a configuration that would cost at least $3499 from Apple. That’s excluding case, PSU and OS, but adding another ~$350 takes care of that and still saves you some money. If you opt for Radeon HD 7870s instead of the W7000 you can knock another $1000 off of that total price. All of that being said, I don’t expect there to be a lot of cross shopping between DIY builders and those looking for a Mac Pro.